A more conventional World War Two and Holocaust tale than its predecessor, Rose Under Fire is a strong return for Elizabeth Wein into the world of female-lead historical fiction in a market dominated by tales of masculine heroism and courage. This is Rose’s story: an American, somewhat naïve ATA pilot delivering planes around the UK during the summer of 1944. She has her whole life in front of her; loves to discover, poems to write, until, one day, she is caught high in the skies above France by two German planes and escorted into German territory. In a matter of hours, everything she has taken for granted can no longer be relied upon as she is taken to a Ravensbruck concentration camp. All she is left with is the courage of the human soul and the camaraderie of her fellow inmates…and even that can’t always be relied on. Let’s be frank: the Second World War has been pillaged by authors for tales of human courage, hopeless hope and terrible despair. There is very little left that allows anyone to be original during the time period; and yet, Wein has again found unmined potential through her unique, female, pilot’s perspective: offering a view of the war from skies but perhaps more importantly, a female character to challenge the bravery, ingenuity and strength of any number of male WW2 protagonists, just as she did in Code Name Verity. But don’t let that make you think that Rose is just a carboncopy of Verity or Maddie; she isn’t. Rose has other hopes and dreams – and there’s a sense of thrill at her involvement in the war effort, despite her naivety. In many ways, Rose has far greater emotional growth than either Maddie or Verity, and Ravensbruck forces her to mature, and quickly. Just as Rose becomes accustomed to the horrors she witnesses and faces, so does the reader. 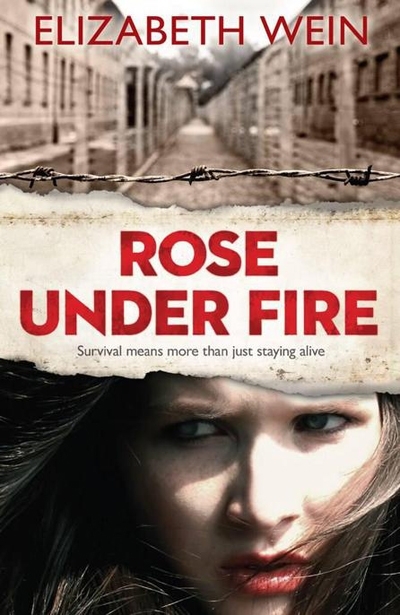 Interestingly, Rose Under Fire also has a particularly strong focus on the psychological aftermath of concentration camps and giving the impression that even when the War is over, the psychological battle is not – how can you ever forget the cold? The pain? The experiments they did to you? Thankfully, Wein’s use of poetry gives moments of reflection throughout the narrative that help Rose Under Fire become more than just sensationalism, allowing the reader the necessary time to reflect and process the horrors of the “Rabbits” and Ravensbruck in general. It may not be as clever as Code Name Verity, but Rose Under Fire‘s success is ensured by the strength of its characters which, whilst not always likeable, are always lovable. 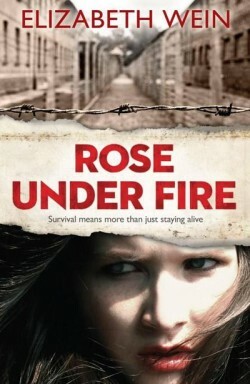 For those looking for strong (but realistic) female characters in a WW2 setting, Rose Under Fire has plenty to offer and will provide a thrilling and engrossing read, aided by Wein’s easy prose that captures her narrator’s voice perfectly and drives the novel onwards to the hopeful ending. Elizabeth Wein: Ethiopia, Flying and “Foreignness”!